Normally when we interview a guitar builder on Guitar Hive, we use their answers to our questions to construct a narrative, using their words to tell a story. In doing that, we hope to convey their passion for what they do, while we pick their brains for advice on the build process. On this occasion, we haven't done that. Virgil Mandanici's passion for what he does leaps off the page and tells its own story. So, this time, we're posting it as is: the questions we asked, and the answers Virgil gave us. Here it is. How long have you been making guitars? I have been teaching guitar for nearly 20 years now. About 5 years ago, I wound up with an 11 year-old student named Dominic who is an amazing prodigy on guitar. His father had been a cabinetmaker/woodworker for over 20 years at the time and saw a guitar I had Carvin build for me. He also saw that I was a digital artist and had this crazy idea that I would be able to build a guitar. I thought he was crazy, especially because of the complexity of guitars was way beyond anything even HE had attempted! I started designing some ideas on my computer and realized that in Adobe Illustrator, I was able to print out things that were dead-on accurate, size-wise. Since I was already a pro at this program, I figured I could design everything in there and print out any template I needed that could be used for the body shape, inlays, etc. 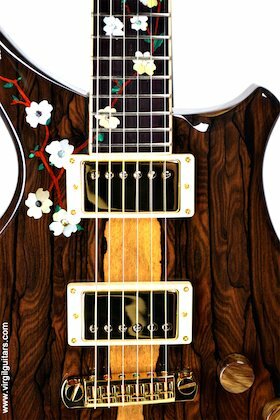 I also wanted to do something spectacular with inlays on my guitar, so as I was designing the guitar, I was cutting my teeth on inlays for 3 or 4 months, dedicating around 40 or more hours per week on “mastering” the process. I had a couple other builders giving me suggestions along the way as well to answer just about any question I could come up with. Tell us about the first guitar you built? Other builders thought I was insane for attempting to build the “Dueling Dragons” guitar. Now that I look back, I understand why. It was something that nobody had ever attempted before for a first build... a set-neck and insane inlay just to mention a couple elements that really are for a different level of building. Things went really wrong during that build, but I refused to have anything stop this beast that I had hundreds of hours into. In October of 2011, the guitar sold for $17,000.00. I made a documentary film that covered the almost year-long journey and it was to change my life so much, but I had no idea at the time! It was a drop-top with an ebony top, maple “soundboard” and genuine mahogany body. Maple neck and rosewood fingerboard. 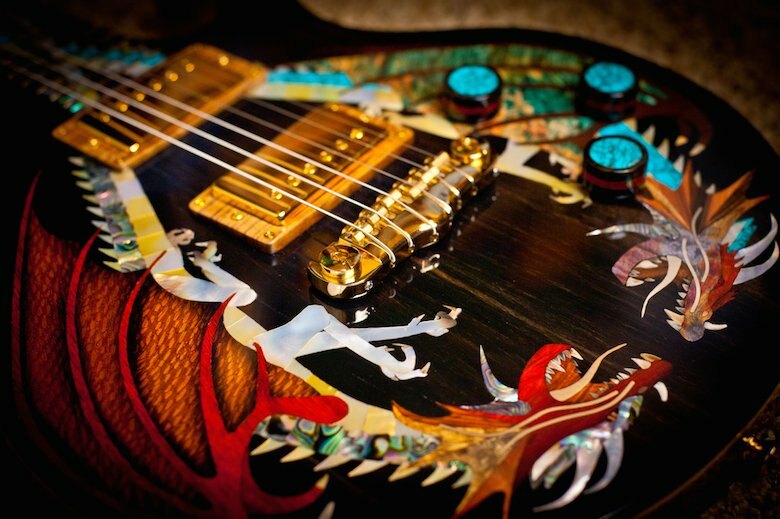 I inlaid 2 dragons on the body with their tails intertwined down the fingerboard. When the guitar was finally completed (just shy of a year after starting the initial designs), I threw a party at my studio and invited several well-seasoned players and wanted them to list any complaints they had about the guitar. They all did the same thing – first, they were deathly afraid to not scratch it! Then as soon as it went into their laps, it was just a guitar. At that point, it turns into “How does the neck feel?” and “What’s the action like”, then my favorite, “Where’s the tonal quality, sustain, etc.”. This guitar was the best guitar they ever played they had all agreed. I felt the same, but after all of the nearly 40 years of playing, performing and recording with guitars, I was able to make the subtleties that I was looking for in a guitar and seemed to nail them on my first guitar. I didn’t just wake up one day and made a “perfect” guitar for myself. I started pushing 50, 60 hours a week on this thing, whether it was practicing on blank wood, talking to other luthiers on the phone, asking questions on luthier forums, reading, reading and more reading and watching tons of videos, I started becoming compulsive-obsessive in making this thing as perfect as humanly possible. I had adopted these behaviors through my life with other things, but for a new love, working with guitars and wood in general. The sad news of the first guitar I built was that it ended up being “too” gorgeous to play. I felt like that it needed to be left in pristine condition, in case of the possibility of selling it down the road. I got tired of “showing it off” – saw that it was really only feeding my ego and ended up keeping it in a case. I had came to the conclusion that my true passion was not to “show off” guitars, but rather digging and enjoying the “process”. The same thing had happened to my music years before. I would rather create a song than play it for you. I started thinking up different designs in my head during the first build and knew I was addicted to building by the end of the first guitar. What would you say is the most important part in building a guitar? Knowing what you like in other guitars is a big factor. I was a Strat guy for most of my 40 years of playing, but loved the tone of Gibby’s as well. I liked the feel of some Ibanez guitars, but about 12 years ago became a PRS fan. I did this because of how solid they were. Strats became somewhat “quirky” feeling to me and I think it was because I was not only switching from a bolt-on to a set neck and single-coils to humbuckers, but also the 25” scale seemed more appropriate to the music I liked playing. (Mainly instrumental rock) I was a rhythm guitarist for my first 20 years of playing, then got into soloing, so I look for the balance between the 2 in a guitar. ALL of these are important things I considered when I went into guitar building. The truth be told when it comes to all of these elements is every one of my guitars has subtle differences from each other. This can be from the bridge I am using, to the neck woods to the body woods, to the nut, to what I am actually wanting to play on a particular day. 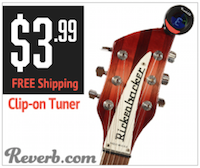 We wind our own pickups in house as well, so the real answer to this question is everything. Everything is a factor and a consideration when creating a guitar and that’s why I spent lots of time when making a custom build – I like to know what the customer is looking for. Sometimes, there are guitarists that don’t even know what a radius is on a fingerboard and I don’t make them feel intimidated about any of that – my job is to educate the client so I can better suit their needs. It’s about a well-thought out plan and making sure each step is executed perfectly as human possible to get it right the first time. What do you take the most satisfaction from when you’ve finished? Hearing what my customers say. Listening (and watching) others play my guitars. It’s not about me (Although I seem that way to most! ), it’s all about them at the end of the day. If I don’t go above and beyond all of their expectations, then why should I be doing this? THEY become my sales team. If that happens, I get to do this for the rest of my time here. This is not a “Right” to build guitars, I look at it more like a privilege and as long as I can deliver the goods, I know it becomes a life-long experience for whoever I am building a guitar for. It’s not JUST a guitar, it’s an experience of my clients that tickles me pink. From the selection of woods they get photos of emailed to them, to doing daily posts on FaceBook & Twitter of their entire process that thousands of fans are watching that are rooting on the build, to the final shipping or local pickup of the guitar is indescribable! Click here to read part 2 of this inspirational interview.